Other Brandy Bottom pages cover the history, and the AIBT's conservation work at the site. The latter is divided into several sections: a summary of the progress at work parties, together with pages of photos of the buildings, work parties, finds and nature. There are also images of the display boards, and a page with a location map, plus directions to the site and the dates of work parties. 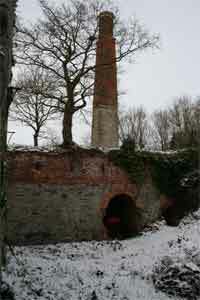 The Brandy Bottom Colliery is located on the South Gloucestershire coalfield in the parish of Pucklechurch, and is the site of a 19th century steam-powered colliery. It lay on the line of the Dramway, the horse-drawn railway that was used to haul coal from the Coalpit Heath area either to the River Avon near Keynsham or to Bristol, and which ran until 1850. The early history is uncertain, but the earliest written record found so far indicates that the first shaft had been sunk around 1837. At that time it was known as ‘Lord Radnor’s Pit’, and the first recorded use of the name ‘Brandy Bottom’ does not occur until 1856. Handel Cossham is known to have surveyed Brandy Bottom prior to taking out a lease and sinking a shaft at the nearby Parkfield pit in 1851. His company, Wethered, Cossham and Wethered, took out a lease on Brandy Bottom in 1871, and is thought to have sunk the southern shaft around this time. Brandy Bottom was then connected underground to the Parkfield pit, and used for hoisting coal from the latter, as well as for pumping and ventilation. As a result the complex is sometimes referred to as ‘Parkfield South’, with the original pit being known as the 'South Pit' and the 1871 shaft as the 'New Pit'. Cossham died in 1890, and his coal mining assets in the area were acquired in an auction by the East Bristol Collieries company in 1900. It is thought that coal hoisting at Brandy Bottom ceased sometime before the First World War, and the pit was then used for ventilating Parkfield and acting as an emergency exit. The Parkfield pit was closed in 1936, and Brandy Bottom has been derelict since then. It was made a Scheduled Ancient Monument, No 1091400, on 22 January 2001. There is more about the history of the pit on the Brandy Bottom history page, and a 2-page handout can be found on the Archive page. The scheduled monument area consists of two groups of derelict buildings, plus a number of other features such as spoil heaps or batches, in an approximately triangular site. The northwest boundary lies along a disused railway cutting. Part of the cutting is included in the scheduled area, together with the spoil heap that marks the southern boundary. The north east edge of the monument lies along a shallow ditch. The buildings are built of stone and brick. The northern group, or Old Pit, were built around the original shafts, and can be seen on the right of the aerial photo. The complex includes the Cornish Engine House, the Vertical Engine House, and a heapstead. Both engine houses are roofless, and several of the walls of both buildings have collapsed. This complex includes the distinctive 23 m high chimney built to an unusual design. The lower part of the chimney is square in section and made up of layers of blue and white lias. The top is built with red bricks, initially square in section but with an octagonal top capped with stone. The southern group of buildings were laid out by Cossham as his 'New Pit'. 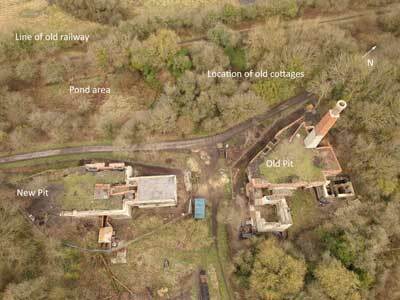 They comprise the 1871 Horizontal Engine House and associated heapstead, and can be seen on the left of the aerial photo. The Horizontal Engine House is the only roofed structure on site, and has an arched roof. 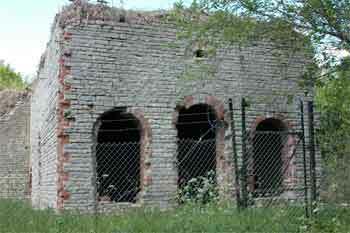 There are also the remains of brick-built ducts which formed part of the ventilation system. This had been installed at some time between 1915 and 1936, and contained a Sirocco type fan. These ducts may be a unique example of their type and age in this area. The scheduled area includes the site of a pond lying between the railway cutting and the main colliery buildings. This is thought to be the water supply for the colliery boilers, and has a culvert built from bricks at the northwest end, and a stone culvert at the other end. The two halves of a winding wheel, located on either side of the path at the northern end of the site, have been included in the scheduling even though they were not from Brandy Bottom. They came in fact from a colliery in Wales, and Sustrans placed them there to mark the spot where the cycle path crosses the line of a Roman road. At 20 feet diameter, they are much larger than the 13 foot and 7 foot diameter wheels in the 1900 sales catalogue. The northern tip of the scheduled area is marked by a roofless building on the Pucklechurch side of the cycle path. This is in fact a modern platelayers hut, and not the weighbridge mentioned in the scheduling. A comparison between the 1873-1888 and the modern maps on the South Gloucestershire 'Know Your Place' website shows that the weighbridge, or 'Weighing Machine' as it is described on the old map, was located some 40 m closer to the mine. The remains of some cottages are also included in the scheduled area. These are now ruined, but were located to the north of the pond, and can be seen in the 1947 and 1955 aerial photos held in the NMR Swindon collections. The whole group of buildings form a rare example of the surface layout of a 19th century colliery, minus the removable fittings. All the main buildings now on site can be seen in the the plan that accompanied the 1900 sale catalogue. Their survival can be attributed to two things: The first is the slow decline of the site during the last 30 years of its working life as a satellite operation. The other is post-closure aquisition by the nearby Shortwood brickworks. The AIBT has been working in partnership with Ibstock Brick, the landowners, and Historic England on the conservation of the surface buildings. The main aim of the project, which started in 2007, is to halt the deterioration in the fabric of the buildings. JH Consulting of Bath was used as the conservation architects for the first stage of the project. This comprised site and topographical surveys, and rectified photography of the surviving walls, and this was completed by the end of 2008. The second stage, which includes structural surveys,any necessary archaeological interventions, and building conservation, is in progress. The scope of any proposed work has to be approved in advance by Historic England. Information on progress can be found on the Brandy Bottom project progress page of the website. The history of the colliery was published in 2013 (see photo of the front cover on the right). Copies are available through the post at a cost of £9.50, which includes £2.50 p+p, by sending an email request to mlduckhole@aol.com. 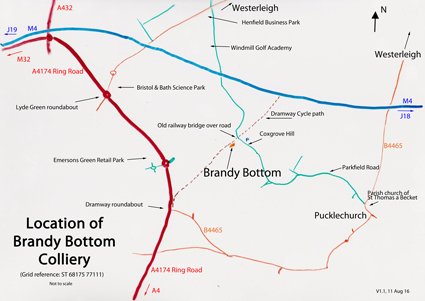 Brandy Bottom is located at grid reference ST 6817577111, about 250 yards south of the point where the Bristol-Bath cycle track crosses Coxgrove Hill (map right). A larger version of the map, and some directions, can be found on the Location and Work Parties page of the website. It may also be located on Google Maps using the coordinates: 51.492210,-2.458960. Public access to the site area during the restoration is limited to those days when there is a work party in progress. These dates are shown on the Brandy Bottom 'Location and Work Parties page of the website. The hours are generally from 10.30 am to 3 pm, though these times may be altered at short notice by the weather or the work in progress. Special arrangements can be made for parties of 10 or more by making contact through the email address of info@aibt.org. The nearest car parking, on road verges, is on Coxgrove Hill. A set of display boards has been made for use at talks and shows. Copies of the latest versions can be found on the display boards page of the website. Other Brandy Bottom pages cover the history, and the AIBT's conservation work at the site. The latter is divided into several sections: a summary of the progress at work parties, together with pages of photos of the buildings, work parties, finds and nature. There are also images of the display boards and a page with a location map, plus directions to the site and the dates of work parties.